Blog Notes: The About the Voyage page has been filled in. There is also a page with a map that automatically shows where we are. 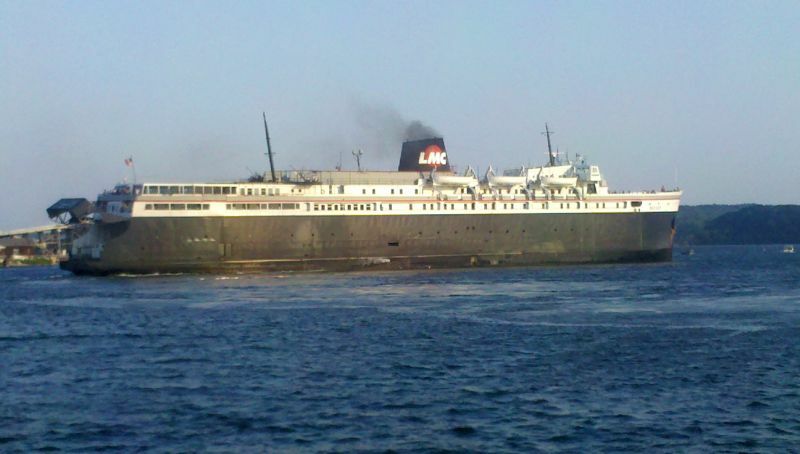 Stuck three days in Ludington, MI due to extremely high winds. I am just not used to this — sunny, warm and 30 knots. In New England 30 knots means gray, cold and raining. I guess these extremes between high and low pressure areas are what spawn the tornadoes. 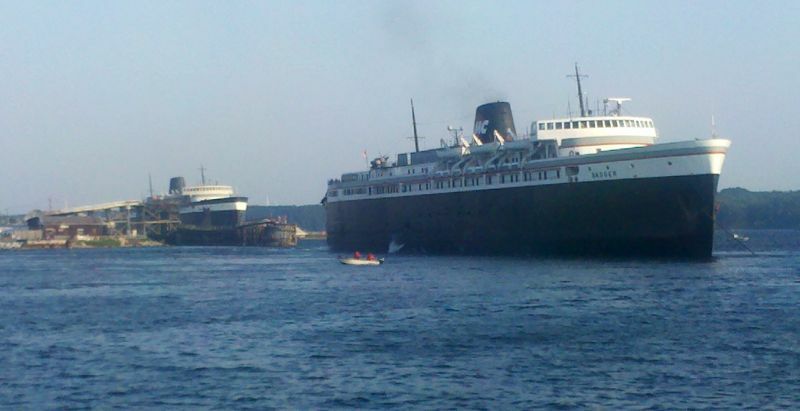 Ludington is not a bad place to be stuck. Nice municipal marina, downtown that’s still alive with restaurants and a great gourmet grocery (Best Choice). Had two excellent meals — Luciano’s (red sauce Italian, but really good red sauce Italian) and barbecue take-out from “Bones and Butts” started by a Kentucky guy who thought Michigan people weren’t getting enough ribs. Luciano came out to see the tourists — about 70 years old, chefs coat, chefs clogs and pajama bottoms with what appeared to be little kangaroos on them. Hey — it’s hot back there with the raviola and veal parmigiana! 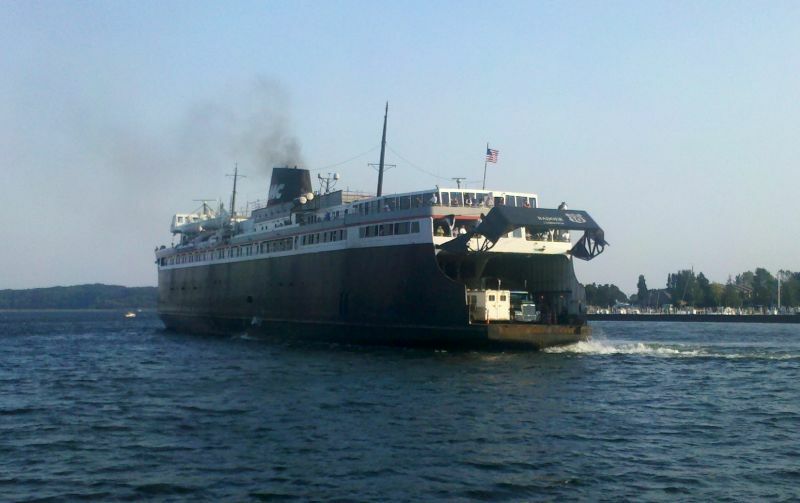 But the big deal in Ludington is the Badger — a 451-foot coal fired ferry that crosses to Wisconsin once a day and an overnight trip. 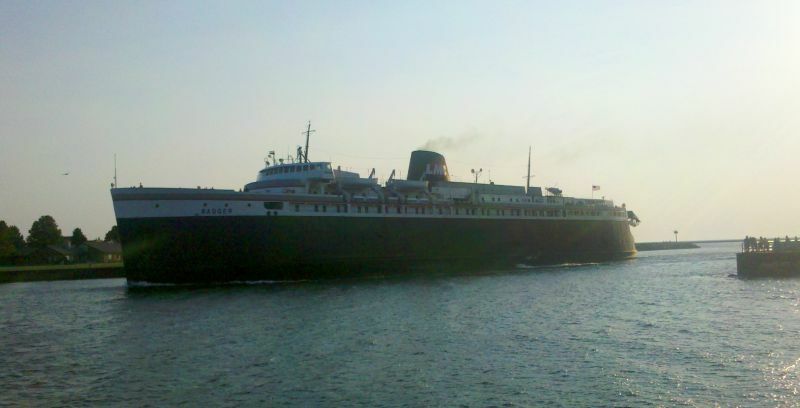 A wonderful sight, in continuous service since 1952 — almost as long as I’ve been in continuous service. Some nut case is trying to close the Badger down because of the coal. This cannot be. This is our heritage, this is important for people to remember — every nine-year old that gets to SLEEP at NIGHT on a HUGE SHIP will be a better person because of it. And the Badger is chock full of long-distance trucks saving going though Chicago burning $5 diesel and getting the drivers their sleep requirement. Badger backs into the dock on a anchor because there isn’t enough room to turn around — that ain’t easy! !